The M8 Greyhound was similar in many respects to the US Army’s light tanks. Both were used in reconnaissance roles as well as for other missions. Both mounted a 37mm gun and a .30 caliber machine gun in their turrets, and mounted .50 caliber machine guns on turret rings for use against attacking aircraft or against ground targets. There the similarities end. The light tank had two more .30 caliber machine guns than did the M8 armored car; both machine guns were hull mounted. By the late 1930s, three types of light armored vehicles were developed and organized under the cavalry. These were combat cars, armored cars, and scout cars. Combat cars (track laying vehicles), designed to close with the enemy frontally, on his flanks, or rear, assisted the horse cavalry units in maneuvering firepower on the battlefield. Armored cars were designed for great road mobility, armor protection, and armament but had no cross country mobility. These cars were not fighting vehicles but armored wheeled vehicles acting primarily as the distant eyes of the horse cavalry division commander. They reported information on enemy locations and conducted delaying missions to disrupt, delay, and disorganize the advancing enemy. Scout cars (also wheeled vehicles) had the same general characteristics and missions as armored cars but were the regimental commander's reconnaissance vehicles. In particular, the M-3 Scout Car capitalized on the desired primary rapid road and cross country movement (tactical mobility), high degree of fighting power (firepower), communications ability, and protection for the crew against small caliber ground and air fires (survivability). However, doctrine recognized the car's vulnerability to tank fire during close-in fighting and sustainability. Light tanks were developed to engage in offensive operations against the enemy. The M8 was not. Light tanks had heavier armor that the armored cars. Light tanks were tracked vehicles that had greater cross-country mobility than did the wheeled armored cars. To the armored cars advantage was a much smaller logistical tail. Armored cars required both less fuel and maintenance then light tanks. Additionally, since it was designed for all armored cars, it had two radio mounts. In the employment of light and medium armored cars, it should be remembered that these are primarily reconnaissance vehicles. When employed in combat their action should be characterized by a sudden appearance, the immediate development of their maximum rate of fire accompanied by constant changes in disposition. Armored cars should never be used in an attempt to hold a locality but should be used far in advance of troops to gain contact, reconnoiter, and delay, eventually withdrawing to the flanks on a covering mission. Unfortunately, perceptions of the M3's performance characteristics centered on insufficient maneuverability and inadequate armament for mounted reconnaissance. The M3 and all other armored car developments were dropped from the US Army in 1937.25 Periodicals contained numerous debates over the mechanization of the cavalrv and the value of armored tactical reconnaissance. Fortunately the need for a lightly armored vehicle for reconnaissance units regained strength in 1939 when Germany used superior motorization/mechanization and tactics to quickly overcome Poland, France, and parts of North Africa. American industry produced only 8,523 M8 Greyhounds during the war. The six-wheeled, six-wheel-drive M8 afforded little protection with only .75 inches of armor in the hull and turret of the vehicle and .13 to .25 inch of armor plate in the vehicle belly. The open topped turret mounted a 37-millimeter gun and .30-caliber machine gun. An additional provision for a .50-caliber machine gun mounted in a flexible mount on top of the turret was available. During World War II the turrets of some M8's were removed and the chassis slightly altered to accomodate a .50 cal mg. This allowed the vehicle to be used as a scout car. The removal of the turret also enabled it to carry additional troops or equipment. In 1943, a standard turretless model was fielded, the M20, which was used specifically as a scout vehicle. The M20 armored car used the exact same chassis and mechanical layout as the M8 armored car but did not mount a turret. Instead of the turret, the M20 possessed a square built-up area in the center of the vehicle. Within this built-up area, a circular weapons ring carried one .50-caliber machine gun. M20 armored cars most often found use as command and control and logistical vehicles alongside M8 Greyhounds in reconnaissance formations. According to FM 2-20 (1944), Cavalry Reconnaissance Trop Mechanized, the armored car was not designed for offensive combat but a basic command and communications vehicle. hy the close of the war, the M-8 was widely criticized by investigating panels on reported non-doctrinal, that it, combat applications for which it was not designed. Of the missions assigned M-8 equipped units, 55% were offensive, 41% security, and only 4% were doctrinal. 2 0 Soon after Worid War II, the US Armmy abandoned development of a replacement for the M8. The M20 was basically a World War II 2½-ton truck chassis with sloped armor plates and sixwheel drive. The driver and co-driver/machine gunner positions were in front and a big Hercules 6-cylinder inline engine was in the rear. Its companion vehicle was the M8, which had a turret-mounted 37mm cannon. 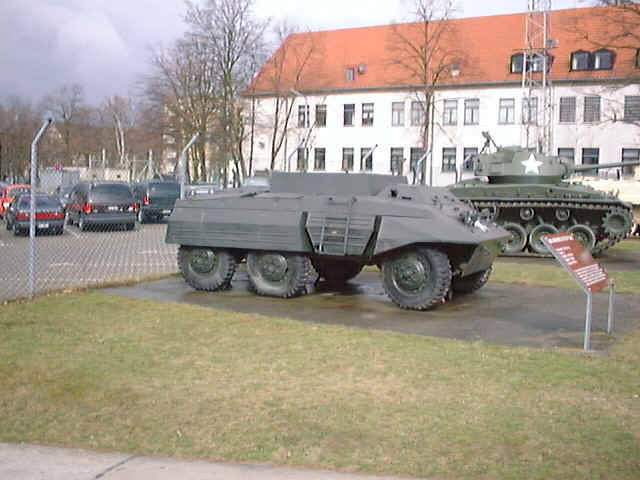 After World War II, the M8 and M20 served with many foreign armies for years. Some were in Korea in 1953, Turkey in 1963, and Vietnam in 1968. The M8 and M20 were difficult to back up and turn around under fire. The off-road mobility was terrible and the armor protection was unsatisfactory. Many World War II NCOs thought that the wheeled armored vehicles were inferior to the tracked vehicles. Because of the Iranian hostage crisis in the 1980s, strategic mobility for armor units became a priority. The pros and cons of wheels versus tracks were discussed at the highest levels; it didn’t seem important whether or not the studies and tests leaned in support of wheeled vehicles. The Marines purchased the light armored vehicle (LAV) while the conclusion in the armor camp was that wheels were vulnerable, inadequate, poorly protected weapons platforms. It seemed that the negative condition was passed on from father to son, or may be it was the “gospel of the tank god."